The Culturally Relevant Computing Lab (CRCL) was started in 2011, by Dr. Kinnis Gosha. Since then, the lab has gained national notoriety as the top producer of Black male PhD students in Computer Science. Students in the CRCL come from diverse set of majors and primarily from Morehouse College. Members of the lab work to investigate problems that intersect with computing, culture and society. Student researchers “work their R.O.L.E.” in the Culturally Relevant Computing Lab. R.O.L.E. stands for the principles of reserach integrity and community cultural responsibility: Research. Outreach. Leadership. Entrepreneurship. Students that join the lab focus on one or more of these approach areas within our varying research areas. Student researchers can look forward to obtaining research experience, giving back to the community, and earning leadership positions within the lab. Typical student researchers work in the CRCL their first summer after joining. 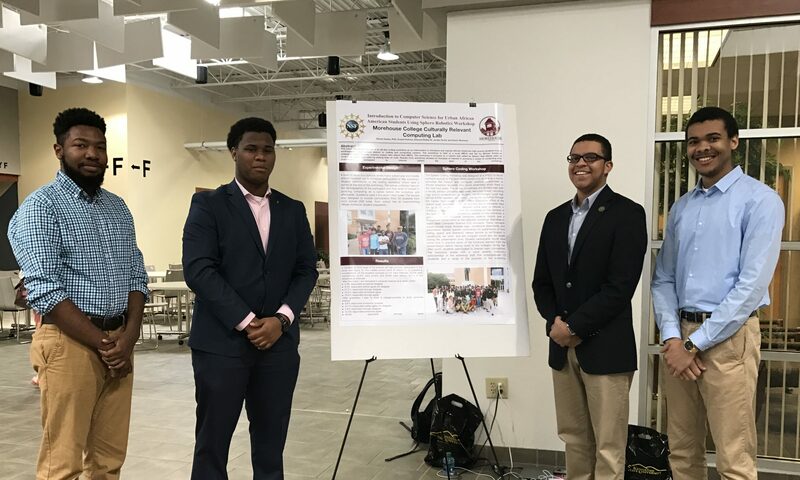 At the end of an on-campus summer research experience, student researchers are required to complete a research poster or paper for submission to a peer-reviewed conference or journal publication. In later summers, students have the option to continue summer research at CRCL or pursue opportunities at other research institutions. All research conducted require completed Human Subjects Assurance training. Please contact Dr. Kinnis Gosha for more information on working in the CRCL.